Elsie Maksymuik (left) at the Heinsburg egg grading station in the 1940s. Image courtesy of Elsie Henderson. I married into a big Edmonton family. The matriarch of the clan is Elsie Henderson (née Maksymuik), my wife’s grandmother. When I’ve asked my wife about Elsie’s past, she always says “Grandma was born in a sod house and grew up on a farm. She came to Edmonton and worked at Lilydale for 30 years, grading eggs.” It’s an intriguing story, and made me want to look a little deeper. What I discovered was the intersection of heritage and history. A major early source of revenue for the co-operative was supplying eggs to Great Britain during the Second World War. Originally the eggs were shipped whole, but they were heavy, perishable, and very fragile. The co-op solved the problem by creating an egg drying operation – the second in Canada. The powder they produced could be used in baking without rehydrating, or could be mixed with water for scrambled eggs. Although the last shipment of eggs went to Britain in 1949, the domestic market remained strong. It was not until 1959 that revenue from meat production overtook revenue from eggs. Over the past 75 years, Lilydale has employed hundreds of Edmontonians. As such, the company is part of many family histories – and mine, apparently, is one of them. Speaking to my mother-in-law Gae (Elsie’s eldest daughter), working with eggs was a family affair. Over the years Elsie helped many in her family find jobs, including Gae. Her most vivid memories are of packing eggs with her cousin Julie. “The eggs came down a conveyor belt and you had to pack them quickly.” She laughs, remembering picking up six eggs at a time just to keep up. “If you got behind, the eggs would fall at your feet and break.” Although the conveyor belt could be stopped, neither Gae nor Julie wanted to, since Gae and Julie’s mothers were in the next room, and neither would be impressed if they thought the girls couldn’t handle the work. After learning more about Lilydale and the family story, something jumped out at me. Lilydale closed their egg operations in 1972, and didn’t get back into it until 1987, when they purchased Alberta Eggs. So how could Elsie have graded eggs for Lilydale for 30 years, as the story goes? For this, I had to go to the source – Elsie herself. Elsie Henderson, 2012. Image courtesy of Gae Jensen. Ever gracious, Elsie happily told me about her life. Not surprisingly, the family lore had some details wrong, and it didn’t even come close to capturing Elsie’s life. She was born, not in a sod hut, but a hospital in Vermillion, in 1928. She grew up on a farm between Dewberry and Heinsburg in a house built by her father, John Maksymuik. When their home burned down in the mid-1930s the family moved to Heinsburg, where her entrepreneurial father bought the local meat market, operated the ferry, helped harvest ice, and farmed a piece of land just outside of town. John Maksymuik (right) and Gorden McMullen (left) cutting ice on the North Saskatchewan River at Heinsburg in 1938. Image courtesy of Elsie Henderson. As if this weren’t enough, one day a neighbour told John he should open an egg grading station. He agreed, and decided to send Elsie, who had just finished grade 8 or 9 (she can’t recall which) to Edmonton to learn to grade eggs. An egg lamp like the model Elsie used to grade eggs in the 1940s. Image courtesy of Tim O’Grady. After grading eggs in Heinsburg for a few years, Elsie decided there wasn’t enough work to sustain her. 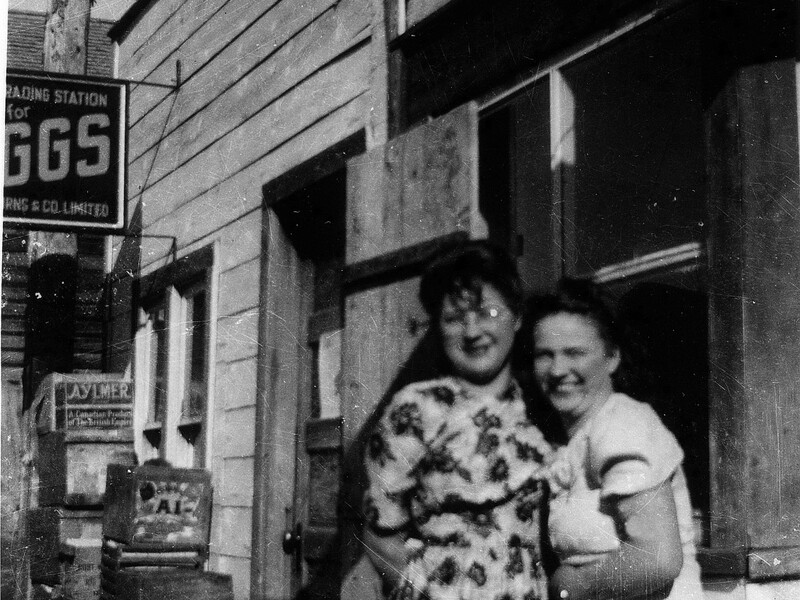 So, like so many Albertans at the time, Elsie left her rural community for the big city. “It was easy to find work as an egg grader” she recalls. She worked in Edmonton, then in Calgary, where she met her husband Al. Elsie and Al wedding portrait, 1952. Image courtesy of Elsie Henderson. Elsie married Al Henderson in Vancouver in May, 1952. Wearing his Navy uniform in the wedding photo, Al shipped out to Korea only a few months later. In 1967, after a stint on the west coast, and another few years in Calgary, Elsie and her family moved to Edmonton, where she got a job doing, what else, but grading eggs. Elsie worked for Alberta Eggs until they were purchased by Lilydale in 1987, and then for Lilydale until 1993, when she retired at the age of 65. Heritage or History: Does it Matter? Once my wife learned the truth – that Elsie didn’t actually work at Lilydale for 30 years like she’d thought – I asked her how she felt. Did it matter? Did it change her own origin story in a meaningful way? She thought about it for a few days, and came back to me with an interesting answer. She sees her grandmother’s story as one about grit. “She came to Edmonton with five kids, no money, and no job. Once she got a job, she stayed and built a life.” The fact that the details don’t always jive doesn’t bother her. For her the story is bigger than Lilydale – it is a story of that generation – starting with nothing and building something. The story ties her to this past – one for which she has no other frame of reference. In essence, this is a part of my wife’s heritage. The story isn’t wrong, so much as incomplete. This gritty narrative of starting with nothing and making a life, which both contributes to, and is reinforced by, social memory in Alberta, is an important part of who we are; as a family, a city, and a province. We might not get all the details right; we might misremember things, purposefully or otherwise, but does it matter? Originally I would have said no. But after speaking to Elsie, I’ve changed my mind. It absolutely matters. To truly understand Elsie’s story, and by extension, the family’s, we need to know more, and we need to frame it in terms of Alberta’s history. The Depression, agriculture, urbanization, labour, the Ukrainian-Canadian experience – all of these things help contextualize my family’s past. The full story, with all its nuances, twists and turns, provides a much deeper meaning and better understanding of who we are and where we come from. It’s not enough to know our heritage – we have to know our history. Tim O'Grady is an archivist at the City of Edmonton Archives. He also serves as a Director with the Edmonton and District Historical Society and sits on the Edmonton Regional Heritage Fair committee. Tim is passionate about local history, built heritage, and sharing Edmonton's unique stories with anyone who will listen. He has a BA in History from Mount Allison University, and an MA in Public History from the University of Western Ontario.